VIJAYANAGARAM: Ananda Gajapatiraj, Maharaja of Vijayanagaram (d.1898). bl.uk > Online Gallery Home	> Online exhibitions	> Asia, Pacific and Africa Collections	> VIJAYANAGARAM: Ananda Gajapatiraj, Maharaja of Vijayanagaram (d.1898). 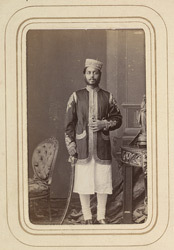 Full-length standing carte-de-visite portrait of Ananda Gajapatiraj, Maharaja of Vijayanagaram (d.1898), from the Album of cartes de visite portraits of Indian rulers and notables, taken by Bourne and Shepherd, early 1870s. Vizianagram was an estate in the modern state of Andhra Pradesh and was ruled by the family founded by Pusapati Rachiraju in late 16th century. Maharaja Ananda Gajapatiraj was born in 1850 and succeeded in 1879. He was appointed a fellow of the Madras university, a member of the Legislative Council of Fort St. George and the Governor-General's Council. He was created Grand Commander of the Star of India in 1892. With Independence in 1947 the princely states merged into the republic of India and in 1971 the royal families were derecognised by Constitution.